We Serve the Optical Needs of Royal! Medical Arts Optical is very proud to offer our full selection of eyeglasses, sunglasses, contact lenses, and more to the Royal community. Take a look below to find out how to get to our great optical shop! After a few miles (3.6, to be exact!) you’ll take exit 4, onto AR-88/Higdon Ferry Rd. and take a right onto Higdon Ferry Rd. In about 1 mile, turn left onto Mall St., and then another left at Central Ave.
And you’re here! 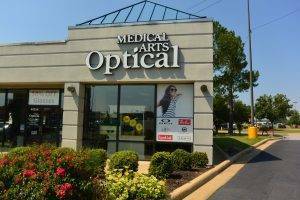 Welcome to Medical Arts Optical! We look forward to helping you find your perfect pair of eyeglasses, sunglasses or contact lenses soon!